Grand Forks Air Force Base is located in the north eastern portion of North Dakota. Strategic Air Command, SAC, chose Grand Forks AFB to be the first missile wing to receive the Minuteman II missile. The history of Grand Forks AFB dates back to 1954, when the Department of Defense chose Grand Forks, North Dakota as the site to build a new base. On February 5, 1956 contractors were awarded contracts and construction began at the base. A short year later, on February 8, 1957, the Air Defense Command, ADC, activated the 478th Fighter Group at Grand Forks. September 1, 1958 found Strategic Air Command activating the 4133rd Strategic Wing as a tenant unit at Grand Forks AFB. Grand Forks had a number of different operational units assigned to its base. Much like Minot AFB, Grand Forks AFB became operational on December 15, 1959 with its Semi Automatic Ground Environment System, SAGE. The SAGE system was designed to provide air surveillance, and the data that was gathered with this system was then passed on to units in the Air Defense Command. In the interest of protecting its B-52 Stratofortress bomber fleet, the Air Force strategically placed its B-52 force amongst multiple Air Force bases, with the strategy that if Russia tried to disable our B-52 bomber fleet, having the aircraft dispersed at multiple wings would diminish overall losses. 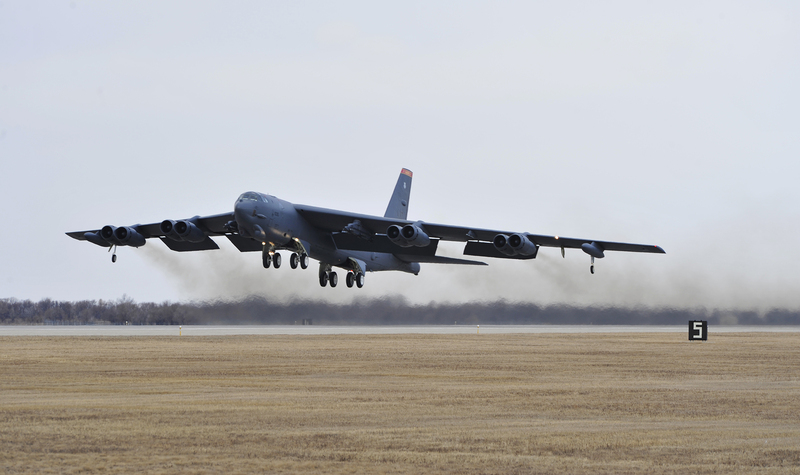 Starting on April 29, 1962, the 30th Bombardment Squadron, a unit that was assigned to the 4133rd Strategic Wing at Grand Forks, received its first B-52H Stratofortress bomber. On November 1, 1964 The 321st Strategic Missile Wing (SMW) was activated at Grand Forks AFB and construction began on its Minuteman II missile complex. The 321st Strategic Missile Wing consisted of 3 missile squadrons, the 446th SMS, the 447 SMS and the 448th Strategic Missile Squadron. In 1965 the three missile squadrons were activated and in August 1965 Grand Forks AFB took delivery of its first Minuteman II missile. This missile was shipped by train from Assembly Plant 77, which was assigned to Hill Air Force Base in Utah. In March 1966, Grand Forks took delivery of another Minuteman II that was shipped by aircraft, the first delivery of a Minuteman missile by a plane, to the Grand Forks Air Force Base. On December 7, 1966 the 321st Strategic Missile Wing at Grand Forks was declared fully operational with its missile complex of 150 Minuteman II missiles. Starting in December 1971 and extending through March 1973, the 321st SMW converted its 150 Minuteman II squadrons to the Minuteman III missile. In addition to upgrading its missile flights with the Minuteman III missile, Grand Forks AFB initiated a number of modifications to its ICBM weapons system throughout the years. In August 1975, the 321st Strategic Missile Wing initiated the Wing Six Integrated Program, WSIP, which consisted of upgrading the missile suspension system in the Launch Tube of each Launch Facility. This improved suspension system assured that the Launch Facility would provide a greater shock reducing buffer to the missile, should a nearby nuclear blast occur as a result of an enemy attack. 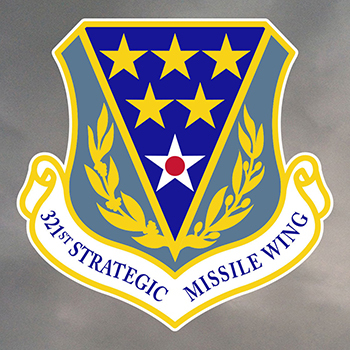 The Base Realignment and Closure Commission chose the 321st Strategic Missile Wing for deactivation. Based on agreements set forth in the START agreements, the commission selected the 321st to be inactivated, but opting to keep the base itself operational. This decision was made in March 1995. The missile wing inactivated September 30, 1998. Based on the parameters set forth in the START II treaty, all Launch Facilities were to be imploded. This process started in 1999 and was complete by 2001. The Minuteman III missiles pulled from the Launch Facilities at Grand Forks AFB were transferred to Malmstrom AFB in Montana, to replace their retired Minuteman II missiles. 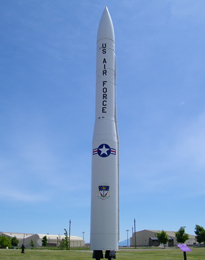 As a result of understanding the importance of developing a defense system that would protect the United States from an incoming ballistic missile attack, the Department of Defense announced on November 3, 1967 that Grand Forks Air Force Base was one of 10 prospective sites to host a Sentinel Anti Ballistic Missile, ABM, site. President Richard Nixon announced on March 14, 1969 that constructing a "Safeguard" system at Grand Forks AFB was now a national priority. Construction of the Safeguard complex started with a ground breaking ceremony on April 6, 1970. 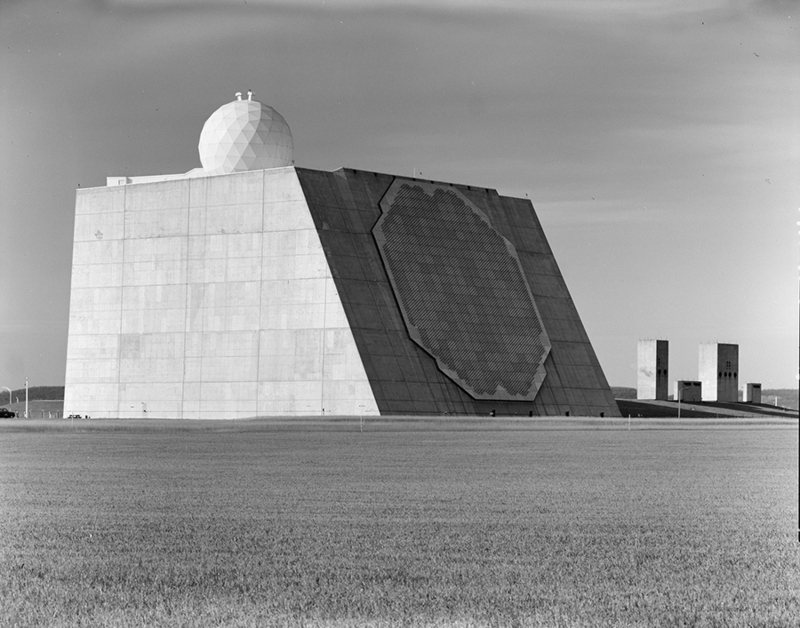 The complex was constructed with twenty five miles separating the 279 acre Perimeter Acquisition Radar site, (PAR), and the 433 acre Missile Site Radar, (MSR) site. There were four remote launch sites constructed that were 36 to 45 acres each, all of which were configured to be within a 20 mile radius surrounding the Missile Site Radar. The Safeguard system was designated as the Stanley R. Mickelsen Safeguard Complex. There was a great deal of political activity surrounding this new ABM system. The new Anti Ballistic Missile (ABM) Treaty was signed on May 26, 1972 by President Nixon and Soviet General Secretary Leonid Brezhnev. The ABM Treaty limited each nation to one site designed to protect strategic forces and one additional site to protect the "National Command Authority." Given that construction work was approximately 85 percent complete at Grand Forks, the United States opted to finish construction at the North Dakota site. A second site, located in Montana, 60 miles north of Great Falls, Montana, was just starting on the second level of the PAR radar site, when they halted construction. One can still visit this site, a huge monstrosity of concrete and rebar that has been abandoned. August 21, 1972 marks the date when the Army Corps of Engineers turned over the PAR site in North Dakota to the Safeguard Systems Command (SAFSCOM) Site Activation Team. The transfer of the Missile Site Radar took place on January 3, 1973. The completion of the four remote launch sites, consisting of either Spartan or Sprint missiles, took more time than anticipated. The last launch site was completed on November 5, 1972. Moving forward 3 years, the Missile Site Radar's launch sites were declared fully operational by April 1, 1975. Given continued issues within Congress regarding the ABM system, the Army operated the system for less than a year. The Perimeter Acquisition Radar complex was saved, but the rest of the Stanley R. Mickelsen Complex was abandoned. The PAR was then transitioned to operational control to the Air Force in October 1977. The site was designated as the Cavalier Air Force Station, in which the PAR was operated as part of the Air Forces' early warning system. The site remains active, and much of the equipment that was installed in the early 70s is still in use today. It is currently operated by the Air Force Space Command, 10th Space Warning Squadron, 10th SWS. For additional information on the Stanley R. Mickelsen Safeguard Complex, follow the link below. This site is by far the most comprehensive websites available focused on the Safeguard Complex, and it contains a wealth of information. The 30th Bombardment Squadron (30 BMS) acquired its first B-52H Stratofortress on April 29, 1962. Throughout the years a number of organizational changes occurred at Grand Forks AFB. After a number of transitions from one designated bomb wing to another, the B-52H, overseen by the 319 BMW, upgraded the distinguished B-52Hs with the reengined B-52G bomber. This modification provided both updated offensive avionics and a longer range for the bomber. On December 4, 1986, the last of the B-52G bombers left Grand Forks Air Force Base and were replaced by the newer and more advanced B-1B Lancer Bomber in 1987. For further information about Grand Forks Air Force Base, follow the link below to their website. Yet another organizational change occurred at Grand Forks AFB, when it was assigned the Northrop Grumman RQ-4 Global Hawk on March 1, 2011. The wing at Grand Forks was redesignated as the 319th Air Base Wing (319 ABW). 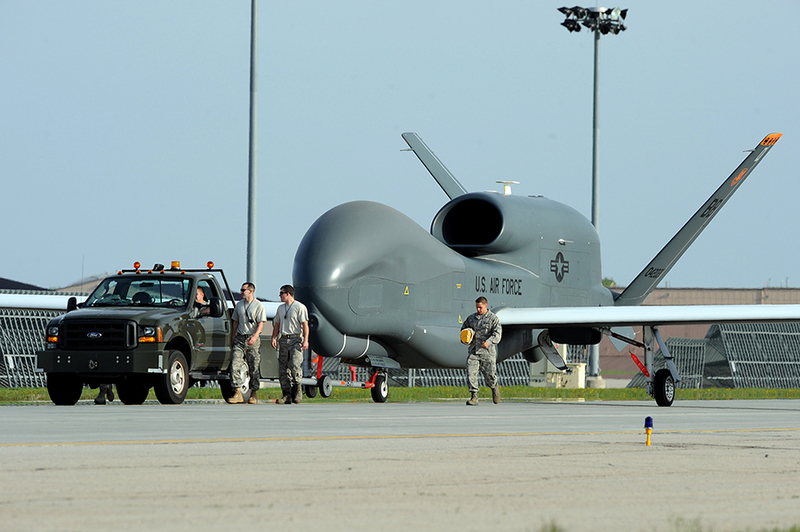 The first RQ-4 Global Hawk arrived to the 319 ABW, and operation of the unmanned craft falls under the responsibility of the 69th Reconnaissance Group of ACC. The Northrop Grumman Global Hawk is a high altitude, long endurance (HALE) unmanned aircraft system (UAS) which has been designed to provide military field commanders with comprehensive, close to real time intelligence, surveillance and reconnaissance (ISR). The Global Hawk also excels at detection of moving targets over a large geographical area that provides key elements of battle management, targeting and situation awareness of enemy actions. The aircraft has a wingspan of 130.9 feet, is 47.6 feet long and stands 15.4 feet tall. The RQ-4 can fly at a maximum altitude of 60,000 feet. It is powered by an Allison Rolls Royce AE3007H turbofan engine possessing 7050 pound feet of thrust and the RQ-4 can carry a payload of up to 2000 pounds. Northrop Grumman has developed a number of variants of the Global Hawk. Some variants are capable of carrying a heavier payload, up to 3000 pounds, compared to the RQ-4 Block 40. There have been a total of four variants of the RQ-4 Global Hawk. Block 10, Block 20, Block 30 and Block 40. Currently there are three variants in use, Block 10 was retired from the Air Force inventory in 2011. The RQ-4 Block 40 has a total gross weight of 32,500 pounds. In 2013 the Air Force was expressing plans to purchase 45 additional Block 40 Global Hawks. Current estimates indicate that there are 33 Global Hawk aircraft as a part of the Air Forces' active force. The first flight of the Global Hawk occurred in 1998. Back in 2001 the estimated cost of the Global Hawk was to be approximately $60.9 million per aircraft. In 2013 the cost of the RQ-4 had increased to $222.7 million, which takes into account the development costs in addition to production costs. In 2010 it was announced that the United States Navy had developed the Global Hawk into the MQ-4C Triton maritime surveillance aircraft. The differences between the Navy MQ-4C from the RQ-4, centers mainly on its wings. 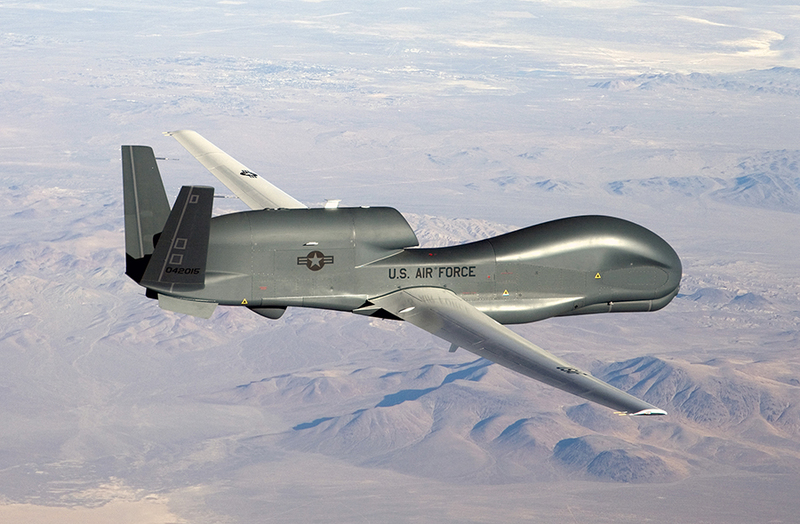 Given that the Global Hawk essentially remains at high altitude to conduct surveillance, the Triton was designed with wings that allow it to climb to 50,000 feet which allow it to see a wide area, but it also has the capacity to drop down to 10,000 feet to allow it to gather more data used to specifically identify any target/targets. The wings on the MQ-4C Triton are specifically designed to be much stronger, allowing the wings to take the stresses of rapidly decreasing the altitude of the aircraft. To view the R-Q4 in action, follow the link below to see a Youtube video of the Global Hawk. The Air Force Global Hawk RQ-4 has been utilized in a number of missions since its first flight in 1998. The following are two notable missions in which the Global Hawk was deployed. In May 2014 a Global Hawk was called upon to provide a surveillance mission over Nigeria in an effort to locate the kidnapped schoolgirls. The RQ-4 has also been utilized in the Operation Inherent Resolve against the Islamic State of Iraq and the Levant (ISIL). The Global Hawk is able to provide real time imagery and signals intelligence to identify friendly and enemy forces. The Global Hawk excels in providing long term target development as well as tracking enemy equipment movement. The compiling of this comprehensive information makes it possible to the combatant commanders to rely and act upon more accurate and detailed information in making key decisions.